Millard Fillmore, the son of a poor farmer, was born in Cayuga County, in 1800. After a brief schooling he found work as a clerk in the law office of a county judge. By 1823 he gained admission to the bar in Erie County and moved to Buffalo to practice law. 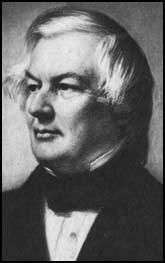 Fillmore became involved in politics and in 1828 was elected to the New York legislature. He joined the Whig Party and in 1832 won election to Congress. He soon became one of the most important figures in the party and in 1848 presidential candidate Zachary Taylor selected him as his running mate. Taylor obtained 1,360,101 votes and defeated the Democratic Party candidate, Lewis Cass (1,220,544) and Martin Van Buren (291,263) of the Free Soil Party. The great issue before the nation was the problem of slavery in the land taken from Mexico. New Mexico and California were being ruled by military governors but Zachary Taylor favoured them becoming part of the United States. This became more complicated after the people of California and New Mexico approved constitutions prohibiting slavery. Taylor's son-in-law, Jefferson Davis and John Calhoun, led the pro-slavery faction in Congress that opposed the admission of California and New Mexico as free states. Zachary Taylor died on 9th July, 1850 and was replaced by Fillmore as president. Fillmore, who detested slavery, but wanted "to get rid of it without destroying free government". He therefore signed the Compromise of 1850 and tried to enforce the Fugitive Slave Law. This upset the radical wing of the Whig Party and he failed to win the presidential nomination in 1852. After the defeat of Winfield Scott, the Whigs split into two factions. The radicals formed the Republican Party and the conservatives the American Party. Horace Greeley called them the "Know-Nothing" party. In 1856 Fillmore was nominated for president and one of his main policies was the demand for a 21 year residence in the United States for all foreigners before naturalization. He also called for non-interference with slavery in the territories and a victory for John C. Fremont and the Republican Party would result in the South seceding from the Union. In the election James Buchanan (Democratic Party) won with 1,838,169 votes. John C. Fremont got 1,341,264 and Fillmore came third with 874,534 and the only state he won was Maryland. In the 1860 presidential election Fillmore supported John Bell and the Constitutional Union Party. Although he opposed Abraham Lincoln he supported the Union Army during the American Civil War. Millard Fillmore died in 1874.